The new Cambridge green roof policy will soon be delivering green roofs in both the city and the county. In the first place, an integrated water management approach will hopefully drive green roofs on new developments. Secondly the City has a great example that shines as beacon for the future of green roofs – the David Attenborough building. Furthermore, biodiversity is key to the roof which is not surprising considering the building houses the Cambridge Conservation Initiative. The David Attenborough Building is an iconic brutalist building originally designed by Arup Associates in the 1960s. However, it underwent a refurbishment to house the Cambridge Conservation Initiative (CCI) in 2015 by Nicholas Hare Architects. The refurbishment included redesigning the roofscape. The CCI engaged The Green Infrastructure Consultancy Ltd to provide a green roof design with integrated solar panels. 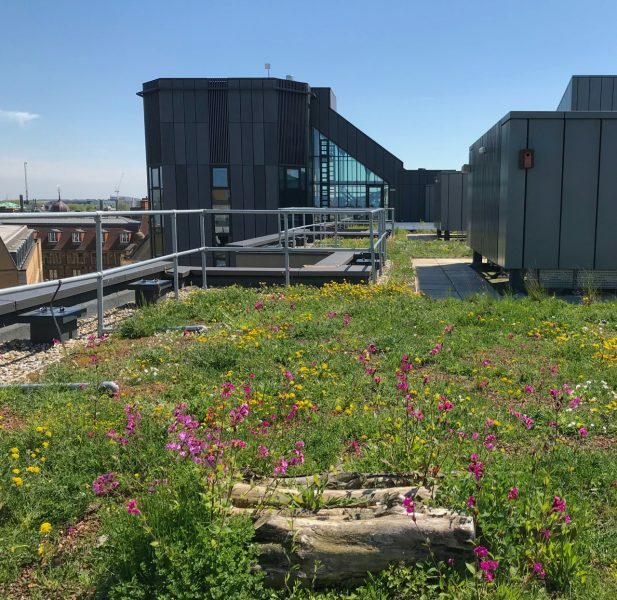 Of course the purpose was not to merely provide a green covering but to ensure that the green roof provided meaningful benefits to local biodiversity. This is not surprising as the activities of staff inside the building is to drive nature conservation. Whilst there is often a desire for an instant green roof effect, it pays dividends to allow a green roof to slowly develop. In so doing, the vegetation has been able to adapt and slowly cover the green roof. The effect is one of colour, diversity and also a haven for native pollinators. Native seeds associated with ‘open-mosaic habitats‘ were sown across the substrate. Obviously seeding takes time to germinate and it takes a number of years for the whole roof to become covered in wildflowers. Furthermore, there is little maintenance required. This my come as a surprise consider the healthy look of the roof. And what a perfect green roof it is. 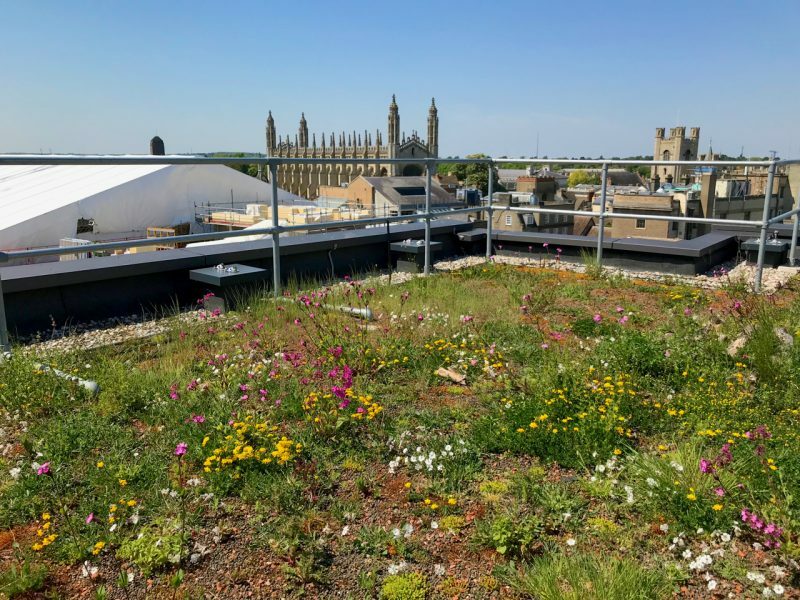 We hope that the green roof at the David Attenborough is a beacon for the new green roof policy that will shortly come into effect in Cambridge. And, of course, we hope to see more wildflower meadows atop roofs across the city and the county.